Having an ATM is not always practical for a number of reasons. Just not enough room. Concerns about after hours break ins or not wanting to document and manage the cash. More and more merchants are going with a Point of Bank (POB) solution so they can make money on each transaction instead of paying processing costs when customers prefer to use bank cards. POB terminals are convenient for customers to get cash back when making purchases and merchants love them because the convenience fee paid by the cardholder also pays for the cost of processing ACH transactions. This enables merchants to accept card payments at no cost to their business. A POB machine looks like a credit card processing terminal but provides for the ability to run transactions with a convenience fee similar to the way a traditional ATM works. 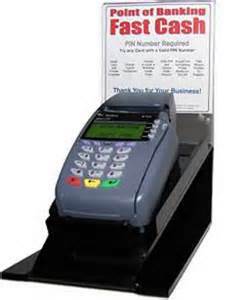 Customers simply swipe their card and follow the instructions on the terminals screen. Once the transaction is approved the terminal prints two receipts. One is for the customer to keep for their records, and the other is given to the merchant to pay for services or product or for cash back. The merchant receives their funds in their bank account electronically in about 3 business days. The merchants profit from the surcharge for each transaction is electronically deposited by the 15th of every month for the previous months processing. Call or request more information now to get your POB machine.